For the Piper family, life's all about the little things, the bits of daily business that somehow always manage to wind up with a laugh and a smile. We join them in this collection as they (somewhat accidentally) sell their house -- meeting mild misadventure with fortitude and fun as they find a new home. 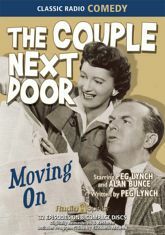 Peg Lynch and Alan Bunce star in this collection of The Couple Next Door, which offers a view of 1950s suburbia through the lens of gentle satire. Francie Myers co-stars as Betsy, with Margaret Hamilton as Aunt Effie in 32 consecutive episodes from 1958.